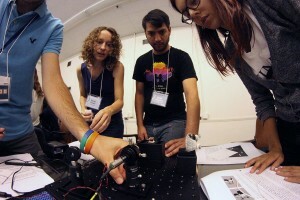 Why should I join the Dunlap Institute Summer School? You should join if you are interested in the basic principles of astronomical instrumentation, how telescopes and astronomical detectors operate in different wavelength regimes, and how advanced astronomical cameras and high-precision spectrographs work. Also, you should join if you would enjoy hands-on laboratory activities working directly with optics and mechanical equipment. Finally, you should join if you plan on pursuing graduate studies in astronomical instrumentation. The summer school is aimed at students who have finished at least the 3rd year of an undergraduate program or are in the early years of a graduate program, and have a background in astronomy, physics or engineering. How much physics/astronomy/engineering do I need in order to attend? You need at least three years of undergraduate course curricula in the Physical Sciences. Helpful topics to have covered previously in undergraduate Math and Physics courses are linear algebra, vectors, complex numbers, multivariate calculus, differential equations, electromagnetism, quantum mechanics and basic optics. This school is designed for senior undergraduates and graduate students with a background in astronomy, physics or engineering. Admission will be based on the information submitted in the application: your academic transcript and CV, a short essay, and a letter of recommendation. I am a first-year astronomy/physics/engineering undergraduate. Am I eligible to apply? Because first-year undergraduate students won’t have a sufficient background in astronomy, physics or engineering, it is unlikely they will be admitted. The school will be of much greater benefit to you if you attend at a later stage in your studies. Does the school offer university credit? No. The school is a non-credit program, but it will greatly enhance your résumé and graduate school applications. Will attending the school guarantee me admission into the graduate studies in Astronomy and Astrophysics at the UofT? No, but participation will look very good on your résumé. Where will the school be held? At the University of Toronto St. George Campus in downtown Toronto. Students will be housed at New College. I am a student outside Canada. Can I apply? We welcome and encourage students from around the world. Each year, students from many countries successfully participate in the summer school. International students should be aware that the school is conducted entirely in English. Registration fee is $500 which covers academic content, program materials, organized events, accommodation, two meals per day (breakfast and lunch), plus the dinner on the first evening. Please note that the registration fee does NOT cover travel expenses to and from the UofT St. George Campus in downtown Toronto. How many students can register? We are planning on having fewer than 50 students in the program. Can I just send you my résumé and ask to be considered? No. A full application must be submitted using the online application form at dunlap.utoronto.ca/summer-school to ensure we receive all the information we need. Will my application be considered if I do not have any reference letters from my professors? No. Your application must include a reference letter from one of your professors. Once I’ve applied, can I update my application? No. Our application tool does not allow you to return to the tool to revise or update information prior to the application deadline. Please make sure that your application materials are in their final form before submitting them. Submitting multiple copies of your application might compromise your admission chances. The deadline is midnight, 28 February 2018. Can I send an application after the deadline? No. All application materials—including reference letters—must be received on or before the registration deadline. Late applications will NOT be considered. The payment deadline and method will be sent to you when you receive your admission confirmation. The registration fee is non-refundable after the payment deadline. Do I have to pay my own way to and from Toronto? Yes. You have to pay your own transportation costs to and from Toronto, unless you have been awarded a travel grant. Also, we strongly encourage all students to explore sources of funding from their home institutes or countries. Many universities offer poorly advertised student travel support in the form of bursaries, grants or scholarships. This support is often available through a local Dean’s office, Faculty office, graduate student union or school of graduate studies. Who is eligible to apply for the travel grant and tuition waiver? We will be awarding travel grants and tuition waivers based on the information submitted to the application: your academic transcript, CV, essay, and letter of recommendation. What is the amount of travel grant and tuition waiver? The travel grant pays for an attendee’s travel to Toronto by plane, train or bus; and local transportation from the airport/train station/bus station to the UofT St. George Campus. Participants will have to keep their original receipts and submit them during or shortly after the summer school for reimbursement. When applying for a travel grant, students must submit figures in Canadian dollars and the amount must be based on the actual cost of a flight, train or bus; in other words, do not submit a guess or estimate. Not complying to this condition will lessen your chances of receiving a travel grant. The tuition waiver means an attendee would not have to pay for the $500 registration fee. If I apply for the travel grant and tuition waiver, will my chances of being accepted decrease? I am from out of town. Will there be someone to pick me up at the airport? How can I travel to the U of T St. George Campus? Where will I live during the school? You will be housed in the safe and secure environment of the dormitory-style, undergraduate residences on the U of T St. George Campus. The residences are located in the centre of Toronto, within walking distance of most of Toronto’s major tourist attractions. Each student is offered a comfortable and air-conditioned single room. Can I live at home during the week and commute in the mornings? Yes, so long as you are able to attend ALL program events and arrive on time (8:30am – 5:30pm). However, you will still have to pay the FULL registration fee which includes accommodation. We therefore highly encourage all participants to stay in the summer school accommodations. Living in residence provides students with a unique opportunity to immerse themselves in a community of fellow learners, and to participate in cross-cultural exchange. If you are a student whose religious or cultural background will prohibit you from living in residence, please contact the Local Organizing Committee at summer.school@dunlap.utoronto.ca for more information. Are there single or double rooms in the residence? Each student is offered a comfortable, air-conditioned single room. Are male students and female students separated in the residence? The residence is co-ed, with individuals of all genders housed together on the same floor, but there are separate bathrooms for males and females. What will be included in each room? Are there laundry facilities and common rooms in the residence? Laundry facilities and common rooms are conveniently located on every floor. Each common room is furnished with couches, tables and chairs, and is equipped with basic-cable TV, a sink, stove, refrigerator and microwave oven. All residents dine together in the residence cafeteria unless there is a special event. The cafeteria offers an “all-you-can-eat” menu. In addition to the main dishes, students will have unlimited access to a wide variety of fresh fruit and vegetables, salad bar, drinks, daily soup selections and dessert. I require a special diet (vegetarian, kosher, etc…). Can I eat in the cafeteria? The cafeteria offers a vegetarian selection (but not kosher) and Halal meat at every meal. Please contact the Local Organizing Committee at summer.school@dunlap.utoronto.ca with any questions or concerns. For social outings, there are many vegetarian, vegan, kosher, halal, and gluten-free options available in the area surrounding the university. What if I have allergies or food intolerance? Can I eat in the cafeteria? If you have allergies or food intolerance, please contact the Local Organizing Committee at summer.school@dunlap.utoronto.ca. I have accessibility needs. Will I be accommodated? While the UofT St. George Campus is not 100% accessible for people who use wheelchairs and other mobility aids, you can request help to address your specific needs in regards to classroom accessibility or access to any building. Please send your request to summer.school@dunlap.utoronto.ca if you have any specific accessibility need.